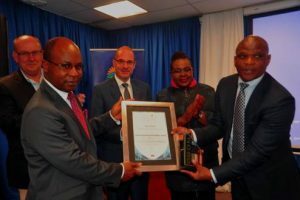 The Coega Development Corporation (CDC) recently hosted the Minister of Energy Ms Mamokolo Kubayi who recommitted the Coega SEZ as one of the preferred locations identified to host the gas to power plant and identified the CDC as one of the important partners to assist the department in implementing some of the projects that are currently going at a snail’s pace. Facilitations: congratulating the CDC on winning the Vision 2030 Awards on Infrastructure Development and its commitment to the realisation of the national development plan objectives. (Left to right – back) Cllr Athol Trollip, Executive Mayor of the Nelson Mandela Bay (NMB), Arnaud de Limburg, Dedisa CEO, Hon Ms Mamokolo Kubayi Minister of Energy. (Front) Christopher Mashigo, CDC Executive Manager Business Development and MEC Sakhumzi Somyo, DEDEAT Eastern Cape. Having created a foundation for Coega’s readiness for energy projects since the early 2000’s, the CDC has successfully been able to attract investors in the energy sector as a result of a decade long of extensive work in preparation for more energy projects. “For us, what is of utmost importance is developing an industrial and commercial energy offtake market in the Eastern Cape and specifically the NMB,“says Sandisiwe Ncemane, CDC’s Energy Sector Manager. The CDC, in 2016 during the Gas Options session/conference, one of the outcomes highlighted the Coega SEZ as one of the locations identified to host the gas to power plant, with an allocation of 1000MW. This has initiated an Environmental Impact Assessment (EIA) study for the gas to power programme and strategically further explored the SEZ’s full potential beyond the current allocation of 1000MW. The CDC has successfully attracted R4 billion worth of energy projects. These include the R3,5 billion Dedisa Peaking Power Plant, with a capacity of 342MW name other energy projects here R9 million lay down area for normal and abnormal cargo. The 12 hectares lay down areain Zone 1 of the Coega SEZ is located on the boundary between the Port of Ngqura and the Coega SEZ and has played an integral role in the regional connection of wind power. Complementing this project is also a million rand 48KW Solar Plant, which feeds power to the CDC head office.